Start in Pforzheim, in the northern part of Black Forest. During 5 days we will cross Black Forest from the north to the south. We will arrive on Feldberg, the highest mountain in this region on Sunday. Beautiful weather this morning. My friend Benny Joerges picked Calle Friberg and myself up at 8.15. Calle is our swedish friend who is visiting us in Freiburg for a few days. Thanks for the support and giving us bottles at the feed zones today! The women had to start in the last group (not a good idea from the organisers). We had about 500 riders in front of us. It was really difficult to pass slower riders. I had the feeling I was only passing people for the first 50 km. Then I finally found a good group that was fast. Good, because I started to feel a bit tired. Now I am on the way home to Freiburg. It is great having the posibility to sleep home. I feel that I recover better. I can cook my own dinner and just take it easy. The starts of the stages are always quite late. Just perfect! I like this stage race. Well organized and also kind of ny home race. 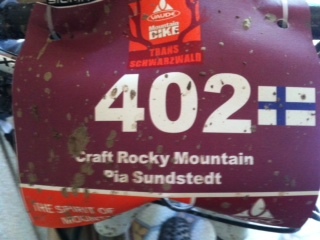 Will be a great 5 days of racing in Black Forest.